The Side street lamp is designed to illuminate the entry into a side street and operates in conjunction with the indicator when the main lighting is switched on. They produce about 700 lumen each. Because of their location they are illegal as fog lamps, the Rule being that 'fogs' must be inboard of the extremities of the bodywork by at least 400mm on each side. They are legal for their given task; they fall under the ruling of Auxiliary lamps as an aid to vision and are correctly located for the purpose. A replacement bulb is a bugger to get! 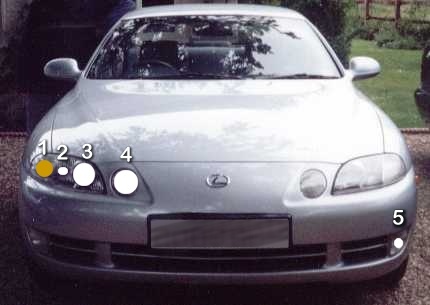 They were supersceded in post 1993 vehicles by a forward facing foglight. The indicator lamp is a 21W white bulb (450 lumen) with an Orange cover to make it 'glow' the correct colour. The sidelight is a simple 5W device and is not very good, it is legal, but dim. I have replaced this lamp with a 10W version, this makes up for the 'dim-dip' feature missing on our cars. The 5W produces 50 lumen and the 10W produces 125 lumen. Dim-dip produces about 150 lumen. Another alternative are the Super bright PIAA LED bulbs available here in the club shop. Be sure to go for the "white/white" type if you want to avoid having to change back to the old bulbs every time you go for an MOT. The Projector Dipped beam is a 55W Halogen unit, producing about 1100 lumen (when it is new) but as with all things it becomes jaded over time, down to about 950 lumen and the temperature of the light drops from 3200K down to 2800K. In my original 1992 model, my replacements are 51W high pressure Xenon units producing 1300 lumen at 13.8V at 3800K they are, to our eyes, twice as bright as my originals. These lamps have a little silvered cap on its' end and it is this cap that ensures you don't have light 'break-over' which causes a fuzzy cut-off and the failing of an MOT. The cap is not on any 'J' type bulbs I have seen, you cannot easily cap them yourself. The projector type lamp unit is VERY sensitive to the limit the lamp projects forward, the cap stops it from over reaching this point. Another alternative are the PIAA halogen dipped beams, again available here in the club shop. Not cheap but producing an illumination equivalent of 110 watts, and therefore doubling the effectiveness of the standard Soarer bulbs. The next lamp is the Main beam, it's a 55W exactly the same as the Dipped unit above. The difference is that it is in a reflector type and this means that the light is spread further up the horizon. On our cars it only produces about the same as the Dipped unit. The same losses occur over time as well. My replacements are 65W high pressure Xenon units producing 2200 lumen at 13.8V at 3800K they are to our eyes more than three times as bright as my originals. These lamps do not have the cap previously mentioned. They are entirely legal. If you want a 'cheap' solution to brighter lights then get FOUR 9005 bulbs from Halfords at around £8.99 each, file away the 'extra' plastic on the lugs and you have 20%+ brighter lights instantly! Not astounding but reasonably effective, at least in the short term while they're relatively new. Remember to remove the twin vanes in the part that slides into the holder! See caption below.